Washington Blue Lion Cortez O’Flaherty delivers a pitch during a non-conference game against Zane Trace Friday, March 29, 2019 at Washington High School. On a mild but overcast Friday afternoon, the Washington Blue Lion varsity baseball team hosted the Pioneers from Zane Trace High School for a non-conference diamond contest. The Pioneers received a solid pitching performance from Kody Haubeil as the visitors got the win, 10-0 in six innings. Haubeil pitched six innings with one hit, three strikeouts and two walks. Zane Joseph started and suffered the loss for Washington. He pitched 2.1 innings allowing eight runs (six earned) on eight hits. He struck out one and did not walk a batter. Cortez O’Flaherty pitched 3.2 innings with two runs (earned) on four hits. He walked two with no strikeouts. Both Washington pitchers each hit one batter. Offensively for Washington, Karson Runk had one hit. Five players for the Pioneers, Christian Fetters, Chad Ison, Tanner Congrove, Lane Larson and Haubeil, each had two hits. The Pioneers scored two runs in the first, six in the third and two in the sixth. After Washington was retired in the bottom of the sixth, the game ended in accordance with the 10-run rule. 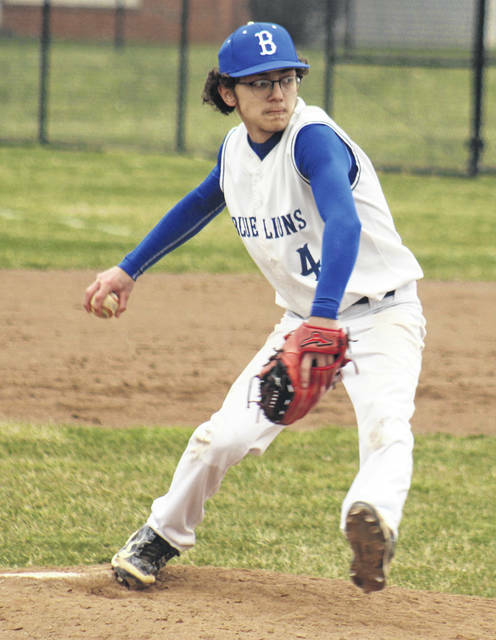 The Blue Lions (0-2) are back in action Saturday at Chillicothe’s VA Stadium, taking on Circleville at 6 p.m.
Washington is at Wellston Tuesday and opens Frontier Athletic Conference play at home against Hillsboro Wednesday. Offensively for Washington: Karson Runk, 1-3; George Reno, 0-3; Tyler Rood, 0-2; Ryan Schwartz, 0-2; Bailey Roberts, 0-2; Eli Shaw, 0-1, 1 bb; R.G. Crabtree, 0-2; Tyler Tackage, 0-1, roe; Cortez O’Flaherty, 0-1, fc. LOB: 2. Offensively for Zane Trace: Christian Fetters, 2-3, 2 runs, 1 bb, 1 2b; Camden Farley, 0-3, 2 runs, roe, hbp; Chad Ison, 2-3, 2 runs, 1 rbi, 1 bb; Tanner Congrove, 2-4, 2 runs, 2 rbi, fc; Lane Larson, 2-3, 1 run, 2 rbi, 1 3b, hbp; Matt Downs, 1-4; Kody Haubeil, 2-4, 1 run, 2 rbi; Mason Lawrence, 0-0; Elliott Lynn, 1-4, 2 rbi; Camden Larson, 0-3. LOB: 7.
https://www.recordherald.com/wp-content/uploads/sites/27/2019/03/web1_Cortez-OFlaherty-pitch-vs-Z-Trace-3-29-2019.jpgWashington Blue Lion Cortez O’Flaherty delivers a pitch during a non-conference game against Zane Trace Friday, March 29, 2019 at Washington High School.